Lord Crumb and I knew that the end of Dying Light was approaching. We had completed all of the side quests (even got an achievement for it) and were about 75% of the way through the main quest at the end of June. It was set aside for a month when we had our vacations together, but last week we finally had the chance to wrap things up. …and then ziplining all the way down for funsies. Then it came down to the very last part of the game. I’d like to say it was a good finish to a good game, but it didn’t really feel that way. There were a number of things that put me off of it. The first was that it was single-player only. So after Lord Crumb and I had spent the entire game together (besides the tutorial section), we had to split up and do things on our own. Next was the pacing and layout of it. 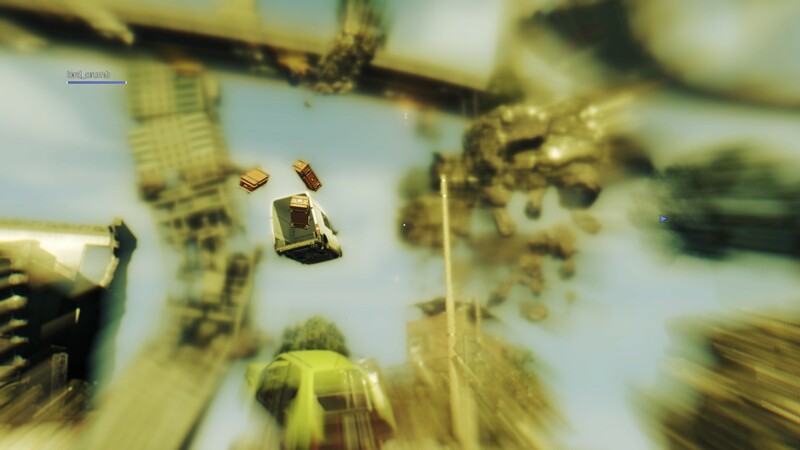 The whole idea behind the game is that it was an open world and you could do just about whatever you wanted. Except at the very end, there are no alternative routes, it’s laid out in a very linear fashion. You can’t even go at your own pace because zombies are spawning infinitely, so you just have to run like hell and hope that you figure out where to go quickly. At one point, I reached what looked like a dead end to me and I spent several minutes running around in circles with a trail of zombies behind me, just trying to figure out where I was suppose to go. The answer, which Lord Crumb had to tell me, was an inconspicuous pipe that I was purposefully suppose to fall down. 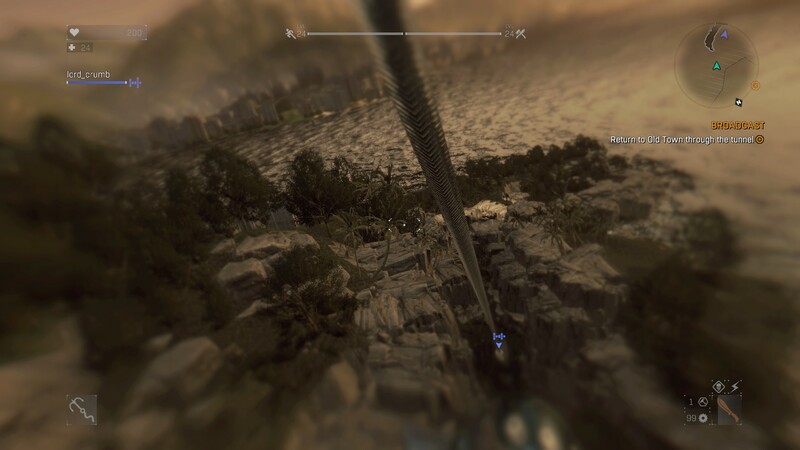 I couldn’t even grappling-hook out of the area because your grappling hook is completely useless in the ending. 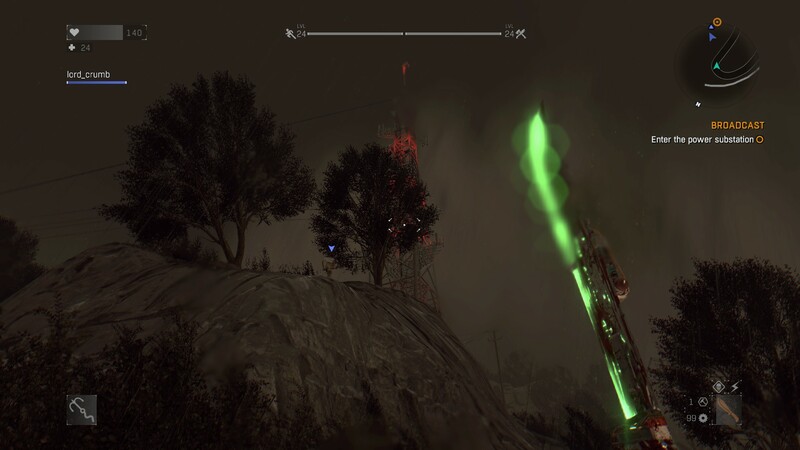 Then it was running through sewers with Volatiles right on my tail and one wrong move meant I fell to my death. Since there was no time for me to take in my surroundings…I died a lot and had to start back at the beginning of the sewer. Poor Lord Crumb had to listen to a lot of frustrated swearing every time I misstepped. Lastly, there were a couple new things that they just threw at you in the end, on top of the mad dashing through zombies. I briefly mentioned before how there’s one type of slow zombie in a hazmat suit with a tank of gas on its back. Everywhere else in the game, they just shuffle around and don’t pose much of a threat unless you damage their gas tank, which causes it to explode. So imagine how surprised we were to find one of these hazmat guys running towards us in this area, and then exploding once it reached us for an insta-kill. 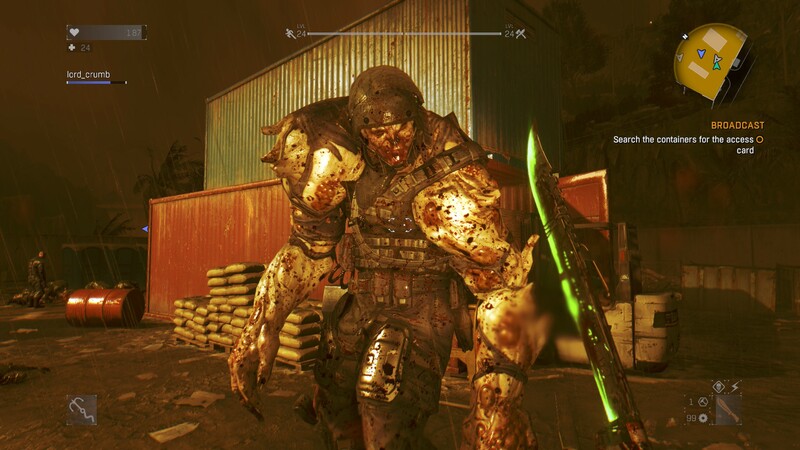 There are already other zombies that do this and have done this throughout the rest of the game, why would they suddenly throw this at us now? Is it suppose to be a “ha ha, we totally killed you and now you have to start this part over again” kind of joke? The only reason I didn’t die was because Lord Crumb was ahead of me and warned me about it. There were also a series of quick-time events thrown in the final fight between the main character and the big bad boss. 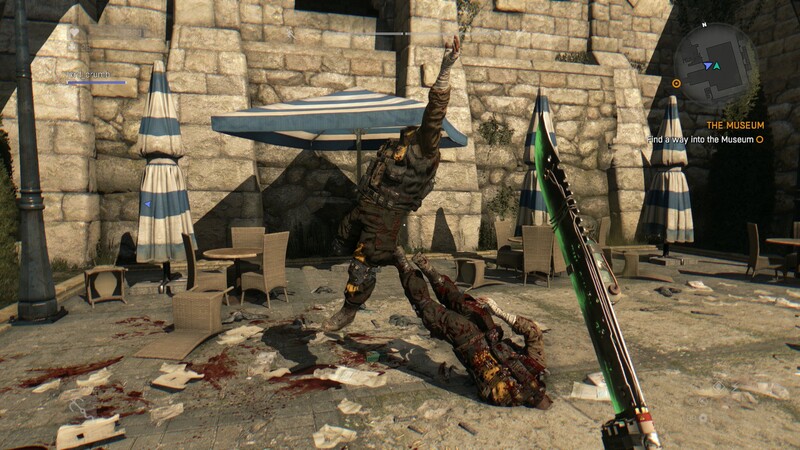 Again, something that had never been used elsewhere in Dying Light. Instead of sitting back and watching the finale unfold, I was gritting my teeth as I tried to memorize the sequence of keys I needed to press just to get through the damn thing. In the end, it was just a relief to have that over with. Unfortunately it meant I left Dying Light with a sour taste in my mouth, for what was otherwise a pretty enjoyable game. (I’ll always be disappointed that there’s no female playable character though). I’d still recommend the game as a whole…but don’t expect too much for the ending. This game looks cool, but I am so burnt out on zombies that I don’t think I would be able to get into it. The Last of Us was the last zombie game I could stomach and even that was a bit of a stretch. So far I have yet to hit my zombie limit. 🙂 If you do ever feel like dealing with the undead again, this game is a good one.